Uber's total Ridesharing business generated $9.2bn vs. $2.1bn for Lyft in 2018. 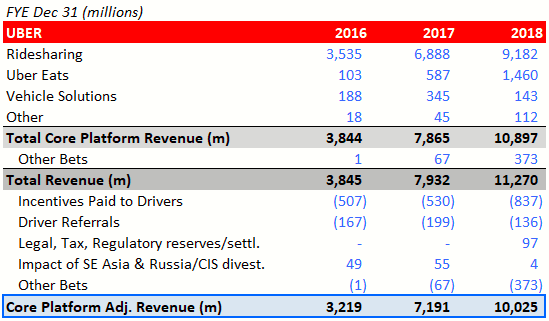 Uber's total Ridesharing business excluding incentives/subsidies generated ~$8bn vs. Lyft Ridesharing (ex-incentives/subsidies) of $1.9bn in 2018. Uber's total US & Canada Ridesharing business appears to generate $4.3bn (ex-incentives/subsidies), which would imply its market share is ~70%. Uber and Lyft Ridesharing businesses are subsidizing rides at a similar rate. 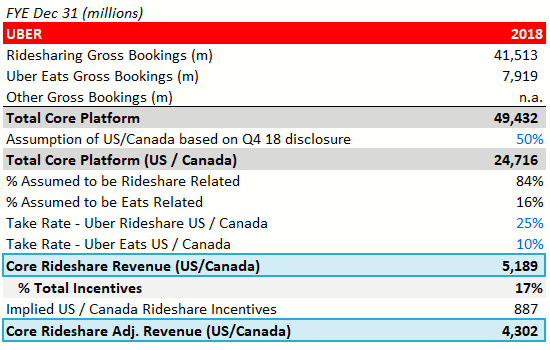 Based on my analysis I estimate a market valuation (note: not my personal valuation) of Uber's US & Canada Rideshare business standalone to be ~$40bn currently. 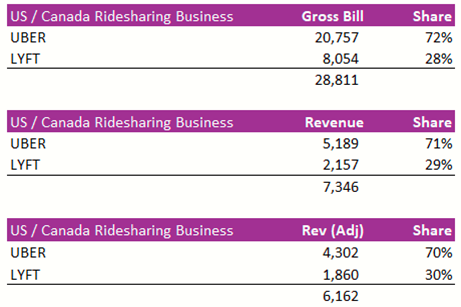 Perhaps the most straightforward valuation exercise to do for Uber is to strip out its US & Canada Ridesharing business and compare it with Lyft's business, which would essentially be a direct Market Comp (note: not my personal valuation). In this note I attempt to do that and arrive at a market valuation for Uber's US & Canada Ridesharing business of ~$40bn. We define Core Platform Adjusted Net Revenue as Core Platform revenue (NYSE:I) less excess Driver incentives, (II) less Driver referrals, (NASDAQ:III) excluding the impact of legal, tax, and regulatory reserves and settlements recorded as contra-revenue, and (iv) excluding the impact of our 2018 Divested Operations. We believe that Core Platform Adjusted Net Revenue is informative of our Core Platform top line performance because it measures the total net financial activity generated by our Core Platform after taking into account all Driver and restaurant earnings, Driver incentives, and Driver referrals. Excess Driver incentives are recorded in cost of revenue, exclusive of depreciation and amortization, and Driver referrals are recorded in sales and marketing expenses. 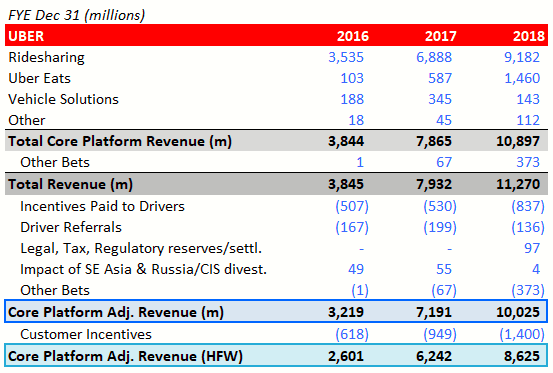 Here is another consolidated view of how Uber's business looks when you break out the adjustment made to get to 'Core Platform Adj. Revenue'. I believe another adjustment must be made to Uber's 'Core Platform Adjusted Revenue', which strips out 'Customer Incentives' (i.e. discounts, promotions, refunds, credits given to Uber customers), which is disclosed and reflected in 'Sales and Marketing' expenses. As a last step, let’s assume that in 2017 and 2018 the $949m and $1.4bn, respectively, of 'Customer Incentives' is proportionally distributed (by revenue) between Eats and Ridesharing and does not follow the uneven distribution of the ‘Driver Incentives’. I believe this is a conservative way to look at Uber’s Ridesharing business (excluding incentives/subsidies) and should be the Base Case assumption. Uber's Core Rideshare Adj. Revenue ex-incentives/subsidies appears to be $7.8bn. Based on disclosure found on F-15 of Lyft's S-1 I believe we can replicate the above Uber analysis for Lyft. Below is a breakdown of Lyft's business excluding these incentives/subsidies. If you compare the figures, Lyft appears to be subsidizing its business in a very similar way to Uber’s Ridesharing business in our Base Case (i.e. 14% vs. 15% (Uber)) and ~5% more in our Upside Case (i.e. 14% vs. 9% (Uber)). To summarize, after stripping out driver and customer incentives/subsidies, Uber’s Ridesharing business generates $7.8bn of total revenue vs. Lyft’s $1.9bn in 2018. Our next exercise will try to make an educated guess regarding how much of Uber’s Total $7.8bn Ridesharing business relates to the United States & Canada. Let’s begin our analysis by following the disclosures that Uber gives us in its S-1. We know from the table above 56% of Total Core Platform (i.e. Eats, Ridesharing and Other) revenues come from the United States & Canada. So, we need to attempt to strip out Uber Eats / Other Core revenue stemming from the United States & Canada OR create a way to estimate the Ridesharing portion. I believe we can estimate the latter through Gross Booking disclosure in Uber’s S-1. To further our analysis let’s make two assumptions. 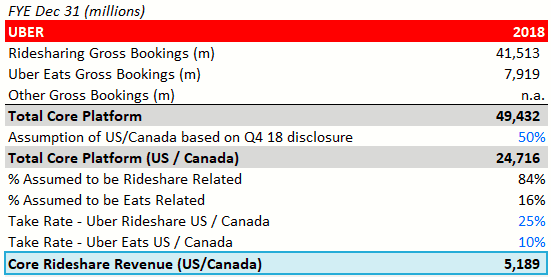 Let’s apply a 25% Take-Rate to Uber’s US / Canada Rideshare Bookings, which is in line with Lyft’s 26.8% take-rate in Q4 2018 and Uber’s disclosure that its take rates vary from 12% to 25% across regions in 2018. In addition, let’s now apply our Base Case assumption on % of Incentives that make up Rideshare to get Core Rideshare Adj. Revenue for Uber US & Canada, which is directly comparable to Lyft’s $1.9bn figure we calculated after stripping out incentives. 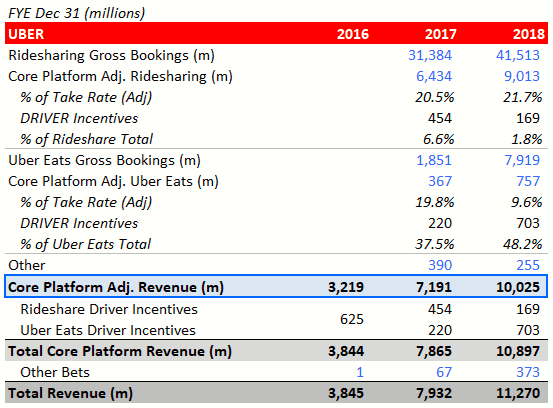 As a final step, let’s sense check the $4.3bn figure to see whether the result is logical (the analysis also implies that Uber Eats US & Canada business is ~$330m ex-incentives, or ~40-45% of Uber Eats total revenue ex-incentives). I believe a good sense check would be to see what the figures say about implied market shares of Uber vs. Lyft on a Gross Billing and Net Revenue basis in the US / Canada Ridesharing market. These figures appear to be in line with Uber’s S-1 US / Canada market share estimate of >65% and almost exactly in line with independent research firms Second Measure and Earnest Research. However, this does not match up with Lyft’s 39% market share estimate and further calls into question Lyft’s market share claim. To conclude this analysis, we will do a simple trading comp analysis to estimate the value of Uber’s United States & Canada Ridesharing business. Currently, Lyft is valued at $16.1bn (as at its Apr 16th closing share price of $56.25). This would imply a 2018 Revenue multiple of 7.5x, which would yield a $39bn valuation for Uber’s US & Canada Ridesharing business. In addition, Uber’s business will likely be given a premium to Lyft’s due to its leading market position, bringing the valuation ~$40bn+.